We are pleased to continue as a participating charity in Americana Manhasset's annual holiday shopping event, Champions for Charity. Since our partnership began in 2013, The Paul Foundation has raised over $50,000 through this important community event. Champions for Charity includes over 70 stores at both Americana Manhasset and Wheatley Plaza, who graciously agree to raise funds for participating not-for-profit organizations, The Paul Foundation being one of them. It is an honor to be part of the event, one of the most anticipated and successful charity events on Long Island. Please be our guest and join us on Thursday, November 29, 2018 between 6pm and 8pm for shopping, champagne, hors d’oeuvres and music at Salvatore Ferragamo Manhasset. We hope you will continue to support our efforts as well as the participating stores who are involved in this philanthropic endeavor. Shopping for Champions for Charity will continue through Sunday, December 2, 2018. Please register for your Champions Card, designate The Paul Foundation, and think of us when you do your holiday shopping. To register, and to learn more about Champions for Charity, click HERE. 100% of The Paul Foundation's proceeds go towards research, grants, education & awareness. Click the button Below. 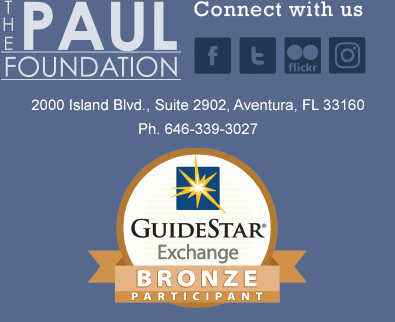 Sign up to receive our Newsletter to stay up to date on The Paul Foundation. We will be sending out a quartetly E-Newsletter to inform you of our progress so if you are interested please join our email list below.